Crawling Berkeley: Make me a sandwich! Oh, Gregoire. Located on Cedar Street off of Shattuck Avenue, this gem is nestled among the many gourmet restaurants that leave our tongues happy and our wallets empty. In terms of fancy Gourmet Ghetto food , Gregoire  is at the top of our lists. Their lunch menu (offered between 11 a.m. and 4:30 p.m.), which mainly consists of sandwiches, is relatively affordable for the fantastic cuisine. The sandwiches range from around $7 to $9. Gregoire generally has a wide variety of sandwich fillings and their menu changes monthly, so there’s always something fresh and new. We recommend getting two sandwiches and splitting with a friend – that way you can try everything! Each of the two sandwiches we got (and shared) came with a small side salad of garbanzo beans (the side varies seasonally). Although both were chicken, they were each their own. The first was grilled chicken breast with goat cheese and fresh cranberry on baguette. The chicken, all white meat, wasn’t what we’d call juicy but was tender and very delicious. The tangy flavor of the goat cheese went well with the cranberry sauce, creating a good contrast. The cranberry itself was very fresh, like a cranberry jam, sweet but just the right amount of sour. Oh, but the baguette that caressed these delicious fillings … we could have eaten it by itself. It was crunchy on the outside, nice and chewy on the inside. We would definitely get this sandwich again, it was like a mini Thanksgiving ! 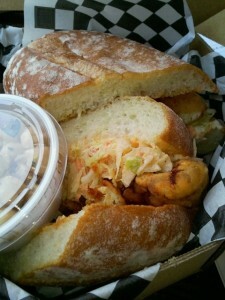 Next up was the fried buttermilk chicken filet with spicy coleslaw on sweet roll, one of the more popular sandwiches. As we bit in, our taste buds were tantalized. The chicken was crispy but tender in its freshly fried exterior. The spicy coleslaw didn’t seem spicy at all to us, almost negligibly mild – maybe the Clog can take more spice than most (we smell another food crawl idea ). The sandwich wasn’t slathered with mayonnaise or other sauces that tend to be overwhelming, and the sweet roll was downright yummy, its chewiness combining well with the crispy chicken. By the way, if you haven’t gotten your fill of fried potato sensations , treat yourself to some crispy potato puffs – you will not regret it. This review is sad in light of the recent fire that afflicted the building housing Intermezzo , but we hope it can be a testament to the power of sandwiches and our hopes that Intermezzo will recover. Intermezzo has long been an important Berkeley establishment, even through their name changes (from Café Intermezzo to Café Mattina back to Café Intermezzo). They have been known for their heavenly homemade bread, delicious beverages and shocking proportions. The restaurant was located on Telegraph Avenue in between Channing and Haste Streets, and you can be sure when they (hopefully) relocate, that the Clog will be among the first to tell you. Fortunately, we were able to pay a visit before the tragic fire. We observed a lot of classic sandwich options as well as some interesting vegetarian and vegan options that looked quite good. 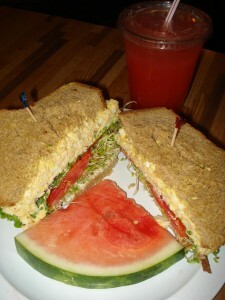 The sandwiches came with a slice of fruit, generally watermelon or pineapple (we got watermelon , yum!). The two bread options we had to choose from were homemade honey wheat and French roll. We tried two sandwiches, the BLTA and Egg Salad Sandwich, both on honey wheat – because that’s the only way to go. 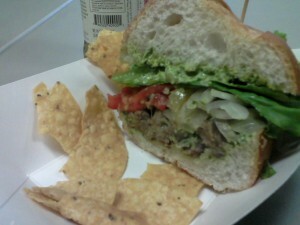 According to the employee we spoke too, the BLTA was their most popular sandwich. BLT … A, you ask? 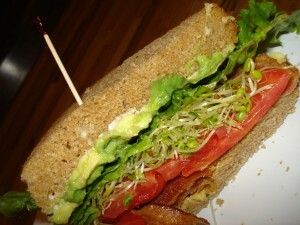 It’s filled with the traditional bacon, lettuce and tomatoes, but with added avocado (and sprouts!). 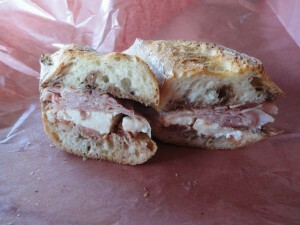 The first bite was nothing short of amazing, every flavor was distinct and we automatically could tell that Intermezzo knows how to make a magical sandwich. The bacon was smoky and just the right texture, the avocado was fresh and ripe and the sprouts added a nice earthy flavor that woke up the sandwich. The bread was sweet like honey, contrasting well with the ingredients. Everything complemented each other well, and the sandwich wasn’t too run down by oil or fat like some BLTs are. 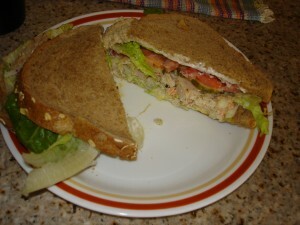 The egg salad sandwich was filled with Intermezzo’s own egg salad, mustard, mayonnaise, lettuce, sprouts and tomatoes. In this sandwich we noticed that the honey wheat bread falls apart easily with the wetter filling and isn’t too refined. The latter works as a good thing, making the bread taste crusty, healthy and robust. 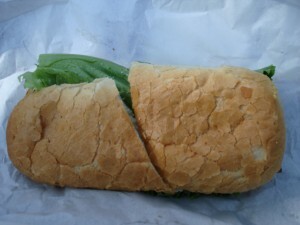 Again, the vegetables refreshed the sandwich, giving it great texture. The egg salad itself was not mixed with an overload of mayo and mustard. It was a bit thicker in texture and the yolk mixed with condiments made the sandwich taste amazing. The mustard was a little spicy and prominent, and it worked great with everything. We also tried the strawberry lemonade, which was really refreshing and washed down the sandwiches well. We spied strawberry seeds floating around in the drink, and it was not overly sugary and tasted like it was made out of real lemons and strawberries – gross powdered drinks, step aside! To Café Intermezzo: we are sorry for your loss and hope you can get back on your feet, imagining a world without you is to hard to bear. Hummingbird Café may not be familiar to all of you, as it lays hidden away past North Gate on Euclid Avenue , across from Bongo Burger. They offer “Deluxe Sandwiches” from $3.75 to $3.95 and “Gourmet Sandwiches” from $4.50 to $5.95, in addition to a falafel sandwich for $6.90. The deluxe sandwiches include turkey, roast beef, salami, tuna, egg salad, BLT and Danish ham, and the gourmet ones include turkey avocado, eggplant pesto and chicken salad. We ordered the chicken salad sandwich, which was a little messy to eat, but pretty good. It was standard fare, but we definitely were taken in by the price. Hummingbird is great if you’re on Northside want a cheap place to eat a sandwich – $4 sandwiches rule. Brazil Café  hasn’t always had such a convenient location, with their colorful stand on University Avenue. Now we see their truck by Sproul Plaza  off of Bancroft Way everyday and it tempts us mercilessly. They offer a variety of items and sandwiches, but c’mon, it’s all about the Tri-Tip Sandwich. The sandwich itself can get a bit expensive (relative to our student budgets), especially if you still need to buy a drink (delicious Brazilian soda anyone?) or fries, but it’s well worth it! 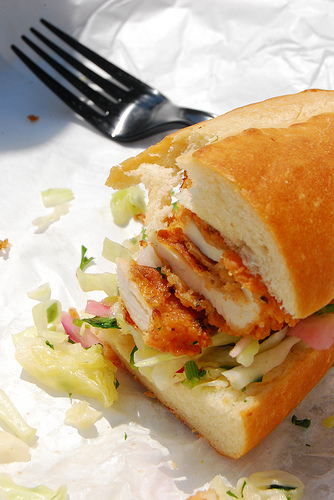 We ordered on a day like any other, but like all great sandwiches, this one changed us forever. Tender and juicy may be overused to describe meat, but that’s exactly what the meat in this sandwich is. There is an excellent merriment of flavors from spicy to salty to sweet – it’s intoxicating. The price starts at $6.99, but it’s important to order a sandwich with everything on it, as a missing element will reduce your enjoyment in this delicious delight! We’re fans of the “Pedro’s Favorite” Tri-Tip Sandwich that we tried, and although it’s a little more expensive at $7.99, it has a surprising combination of extras, like fresh cheese, grilled onions, pineapple, jalapeños and olives. Yes, it sounds weird, but trust us, it tastes amazing on a sandwich. Don’t knock it till you’ve tried it. Some people don’t like the cilantro garlic sauce (we think they’re weird) but it’s worth a try. After all, it’s something different than the usual condiment culprits of ketchup, mustard, mayo or BBQ. There’s no excuse not to try it, especially when it’s out there next to Sproul nearly every day, calling your name. They also have excellent mango smoothies, and will often give you a coupon for a free one next time. Try to come on a day when the owner is there, he is incredibly friendly and encourages dancing to the Brazilian music they play. Do we even need to tell you where the Golden Bear Café is? Or what GBC stands for? 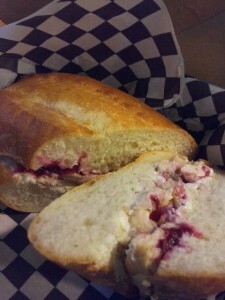 For all those dependent upon meal points, Golden Bear Cafe is typically a go-to stop for sandwiches. But if you can afford it, and would like a better quality sandwich, we suggest you try somewhere else. We sampled a BLT on a soft French roll. The line was long, but there is something nice about the ability to customize and “build” your own sandwich. The bread was standard, but after they ran it through the toaster, it became quite flaky. The overall taste of the sandwich was not bad, but the ingredients were sub-par – in our experience, the lettuce often seems rotten and the tomatoes are almost never fresh. The only ingredients that hold up are the cheeses and the meats. They do offer crispy chicken, and have some other variety in items, from pepper jack to guacamole. All in all however, we’d go elsewhere. The sandwiches start at around $5.25, but with meat and extras that can rack up. But hey, when you’ve just got meal points, GBC will suffice. However, you may call us sandwich elitists. From our poll on the subject , readers seem to agree that the GBC is still their favorite place to grab a sandwich on campus. 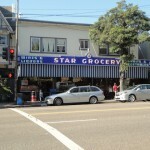 Star Meats  is a little farther away, located inside Star Grocery, a quaint, small market with loads of specialty items. It’s at 3068 Claremont Avenue, between Prince Street and The Uplands, but you can take the 49  to Claremont Avenue and Woolsey Street and you’re only a block away! It’s worth it, plus you can pick up stuff at the market. Sadly, the deli only makes sandwiches from 11 a.m. to 2 p.m., so get there early! Their sandwiches have great – although weird – names (we love that in a sandwich). According to an employee, the Classic (ham, salami, hot coppa, provolone, lettuce, onion, tomato, red wine vinegar, olive oil, spices and a touch of mayonnaise) and Brian Allen  (turkey, cheddar, hot coppa, arugula, tomato and chipotle mayo) sandwiches are the most popular, but he recommended the My Cousin Vinny  (ham, fresh mozzarella, tomatoes, bruschetta, balsamic vinegar and olive oil), so we tried it! It isn’t the most beautiful, complex sandwich we’ve ever had. It only has six ingredients, making the quality of each ingredient especially important. If you love Caprese sandwiches (who doesn’t?) but just wish they would throw some meat on it, this sandwich is for you. No basil comes with, however, but you can probably ask for some! As you feel your hands getting oilier and oilier, you may begin feeling a bit guilty. Don’t fret; it’s extra virgin olive oil! The outside of the bruschetta is delightfully crunchy and holds up masterfully against the balsamic and oil, but the inside can get pretty soggy and mushy if you try to save half of it for dinner. So don’t! Just devour the whole thing as quickly as possible. There is a covered bus stop directly across the street that’s a perfect place for eating lunch. Another destination with a little distance, Bakesale Betty’s  is located in Oakland at Telegraph Avenue and 51st Street, but the 1 and 1R bus  go straight there. And it is so worth the trek . Make sure to go early because they close at 2 p.m., and as with all great Bay Area restaurants, there may be a line. They are closed Sunday and Monday. As the same suggests, they sell a variety of baked goods, including amazing pies  and scones to-die-for. However, what we come here for is the sandwich. They have started offering more options (including vegetarian), but their original and must-get menu item is the fried-chicken sandwich. We headed down early one Saturday and were not disappointed. The chicken is perfectly fried and not too greasy – we would be fine eating it on its own. The coleslaw is unlike any other. It’s not gross and soggy like some coleslaw with mayo, rather it’s a delightful, lightly dressed menagerie of cabbage and jalapeño. The bread, always such an important but understated part of a sandwich, is perfect. Together there is a crispy, soft, spicy, fresh, warm, salty, sweet interplay that we dream about at night. No joke, clogger Fiona Hannigan has had a dream about this sandwich – does that say something? Probably. The sandwich gets a little messy, but that’s why they give you a fork. The sandwich is priced at around $8, but oh-so-worth-it. We’d recommend splitting the massive thing, but trust us, this is something you want to conquer on your own. Add some more holes in your wallet because, as we said, they have more than sandwiches. They also have a tasty lemon ice drink that balances well with the sandwich. We also tried their strawberry shortcake, which was amazing and definitely necessary to share. And if you are ever awake early, go on down and get a scone fresh out of the oven. Their service is also fantastic. The staff is friendly with just the right amount of sass. The seating is quirky and consists of ironing boards and stools on the sidewalk just outside of the location (you can always get to-go, but why not stay and check out Oakland’s Temescal area?) – and we wouldn’t have it any other way. While nursing our food babies, we reflect on the great Tina Fey’s words again: “All anyone really wants in this life is to sit in peace and eat a sandwich.” True words, Ms. Fey, true words.